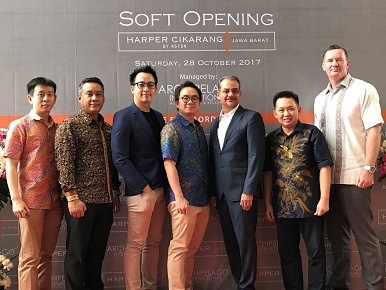 Jakarta, 30 October 2017 - Archipelago International continues to retain its solid reputation as the fastest growing hotel management company in Indonesia with the latest opening of Harper Cikarang. The hotel is the sixth addition to Harper's brand portfolio, following the success of Harper Kuta - Bali, Harper Purwakarta, Harper Mangkubumi - Yogyakarta, Harper Perintis - Makassar and Harper M.T. Haryono - Jakarta. The new Harper features 131 guest rooms and suites, delectable dining options at the signature Rustik Bistro and Bar, as well as upscale leisure facilities, such as a semi indoor swimming pool, a traditional Onsen hot water bath, and modern fitness center. Three meeting rooms designed for the gathering of creative minds can also accommodate up to 100 guests for business events and conferences. Ideal for business travelers in the vicinity, Harper Cikarang is strategically situated in the heart of the Cikarang Industrial Estate, just 30 minutes from hundreds of factories. The hotel affords easy access to the Cikarang Toll Gateway, is around 45 minutes from Jakarta, and just 60 minutes from Jakarta's International Airport, Halim Perdanakusuma. "Cikarang is an industrial area which is bustling with life, commerce and progress. The city itself is a reflection of Indonesia's robust industrial development fueled by record-high foreign direct investments and rapid credit growth, with unique combination of work, shop, live and play for its people. We are pleased to extend our presence in the city with the opening of the first Harper hotel, and we are certain that Harper Cikarang is eligible to become Cikarang's preferred accommodation option in the near future," said John Flood, President and CEO of Archipelago International. 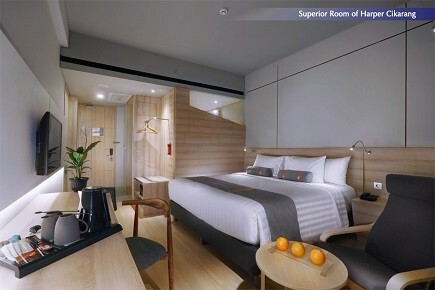 Harper is the brainchild of Archipelago International, an Indonesia-based hotel operator with a portfolio of more than 130 hotels and resorts. Modern, yet infused with rustic charm, Harper Hotels convey a residential feel and balanced functionality, offering unobtrusive service and never-ending innovation - hotels for astute travelers who value individualism and character. To honor the opening of Harper Cikarang, Archipelago International is holding a photo contest on Instagram to illustrate the extraordinary stay experience at Harper Cikarang. Guests are encouraged to post their images along with the hashtags #LiveExtraordinary, #ExtraordinaryStay and #HarperCikarang. The photo contest will run from 30 October to 6 November 2017, and three lucky winners will be picked to win a free stay at Harper Cikarang. Guests can also enjoy a 10% discount by using the promotion code ‘BOOKDIRECT” on the website. Simply download the Archipelago Membership App for more special promotions in all Archipelago International hotels across South East Asia. Archipelago International is Indonesia's largest hotel management chain with a portfolio of over 130 hotels and 17,000 rooms It also continues to have the fastest growing brands with over 100 properties in the pipeline across Indonesia, the Caribbean, the Philippines, and Malaysia. Their 8 core brands include Nomad Hostels,favehotel, Hotel NEO, Quest Hotel, HARPER, ASTON, The Alana and Kamuela, ranging from ultra-luxurious villas to select-service, economy-class hotels to serviced-apartment residences.